(PhysOrg.com) -- Astronomers using NASA's Spitzer Space Telescope have found a stunning burst of star formation that beams out as much infrared light as an entire galaxy. The collision of two spiral galaxies has triggered this explosion, which is cloaked by dust that renders its stars nearly invisible in other wavelengths of light. The starburst newly revealed by Spitzer stands as the most luminous ever seen taking place away from the centers, or nuclei, of merging parent galaxies. It blazes ten times brighter than the nearby Universe's previous most famous "off-nuclear starburst" that gleams in another galactic smashup known as the Antennae Galaxy. The new findings show that galaxy mergers can pack a real star-making wallop far from the respective galactic centers, where star-forming dust and gases typically pool. "This discovery proves that merging galaxies can generate powerful starbursts outside of the centers of the parent galaxies," says Hanae Inami, first author of a paper detailing the results in the July issue of The Astronomical Journal. Inami is a graduate student at The Graduate University for Advanced Studies in Japan and the Spitzer Science Center at the California Institute of Technology. She adds: "The infrared light emission of the starburst dominates its host galaxy and rivals that of the most luminous galaxies we see that are relatively close to our home, the Milky Way." "No matter how you slice it, this starburst is one of the most luminous objects in the local Universe," agrees Lee Armus, second author of the paper and a senior research astronomer also at the Spitzer Science Center. Inami, Armus and their colleagues spotted the buried starburst with Spitzer in the interacting galaxies known as II Zw 096. This galactic train wreck - located around 500 million light years away in the constellation Delphinus (the Dolphin) - will continue to unfold for a few hundred million years. Gravitational forces have already dissolved the once-pinwheel shape of one of II Zw 096's pair of merging galaxies. The ultra-bright starburst region spans 700 light-years or so - just a tiny portion of II Zw 096, which streams across some 50,000 to 60,000 light-years - yet it blasts out 80 percent of the infrared light from this galactic tumult. Based on Spitzer data, researchers estimate the starburst is cranking out stars at the breakneck pace of around 100 solar masses, or masses of our Sun, per year. The prodigious energy output of this starburst in a decentralized location as revealed in the infrared has surprised the Spitzer researchers. The new observations go to show how the notion of a cosmic object's nature can change tremendously when viewed at different wavelengths of light. In this way, the shapes and dynamics of distant, harder-to-study galactic mergers could turn out to be a good deal more complex than current observations over a narrow range of wavelengths imply. "Most of the far-infrared emission in II Zw 096, and hence most of the power, is coming from a region that is not associated with the centers of the merging galaxies," Inami explains. "This suggests that the appearances and interactions of distant, early galaxies during epochs when mergers were much more common than today in the Universe might be more complicated than we think." A fleeting, perhaps prophetic vista? In galaxy mergers, individual stars rarely slam into one another because of the vast distances separating them; even in the comparatively crowded central hubs of spiral galaxies, trillions of kilometers still often yawn between the stars. But giant, diffuse clouds of gas and dust in galaxies do crash together - passing through each other somewhat like ocean waves - and in turn spur the gravitational collapse of dense pockets of matter into new stars. These young, hot stars shine intensely in the energetic ultraviolet part of the spectrum. In the case of II Zw 096, however, a thick shroud of gas and dust still surrounds this stellar brood. The blanket of material absorbs the stars' light and re-radiates it in the lower-energy, infrared wavelengths that gleam clear through the dust to Spitzer's camera. Astronomers were lucky to capture this transient phase in the evolution of the starburst and of the daughter galaxy that will eventually coalesce out of the collision. "Spitzer has allowed us to see the fireworks before all the gas and dust has cleared away, giving us a preview of the exciting new galaxy being built under the blanket," Inami says. Merging galaxies such as II Zw 096 also offer a sneak peek at the fate of our Milky Way in some 4.5 billion years when it is expected to plow into its nearest large galactic neighbor, the Andromeda Galaxy. 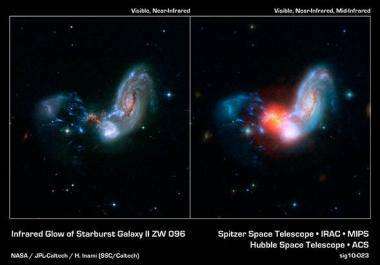 Off-nuclear starbursts such as that in II Zw 096 and the Antennae Galaxy could occur in the vicinity of our Solar System, perhaps, which is located about two-thirds of the way out from the Milky Way's glowing, bulging center. "This kind of dramatic thing happening in II Zw 096 could happen to the Milky Way and Andromeda when they meet in the far future," says Inami. To me, this does not look like a picture of two galaxies in the process of colliding. It looks more like two galaxies that have collided and are now moving apart. Motion toward or away from us should be measurable from the relative red shifts of the galactic cores, but it is probably going to be difficult to determine the motion perpendicular to the line of sight. I can think of statistical ways to tease the net motion out of high resolution images of the respective galactic cores. You want an average proper motion anyway, so a process which measures an average shouldn't be a problem. The problem would be aligning the images to within a small fraction of a pixel in the first place. You would probably have to start with an image of the pair of galaxies, and determine the relative motions. Agreed. Spiral galaxy clearly suffered a glancing collision with dense luminous region, and now moving to the right. Note evidence of gravitational influence being limited to a finite distance, with most of the spiral structure simply undisturbed. LaViolette (SubQuantum Kinectics) predicts this gravitational limit is 10-20K light years. The highly luminous region appears to be a bare active galactic core region, after an extremely violent core explosion in the past destroyed the parent galaxy, the remnants of which are moving both leftward and are recombining into a new structure on the lower right of the view. This is all consistent with the new matter generation and expulsion predictions of SQK. High mass density of galactic core stars periodically explode with newly generated mass (Fermi bubbles, Active Galactic Cores, Novaes, etc.). Black holes are not singularities, having instead a finite mass density, and grow with new matter nucleation therein. Why cling to the idea that collision somehow 'triggered' the luminous starburst region? How? Gas condensation in such an active region??? And if collisions are so common, why don't we see a more even distribution of colliding galaxies? Galaxies seem widely separated as a general rule, in early times and in present times. Those colliding galaxies are often born from a common origin, like this dense bare core seen in this observation. Core ejects new matter, which condenses into new active regions, forming new galaxies over time, which are interacting. "The highly luminous region appears to be a bare active galactic core region"
"Those colliding galaxies are often born from a common origin, like this dense bare core seen in this observation." Do you have published refs to back up those two statements (specifically, that this region of II Zw 96 is one of the two nuclei[and a AGN to boot] and not a starburst region)? I've seen several published papers on Region C & D in II Zw 96 (nomenclature of Goldader et al 97) that directly contradict your assertion. No. Admittedly, this is not my field. I am simply an aerospace engineer with an interest in cosmology. So you may ignore my speculations. Most will. However, I have seen enough to know to ignore mainstream astrophysics conclusions. Just apply a little logic, together with LaViolette's cosmogenic model, and so many observations fall into place. It takes time to think different, but amazingly, observations are supporting the theory. For example, I challenged LaViolette only two months ago on the radial star movement prediction he had made. ("But stars orbit the galactic center", I complained?) This week we saw the news that stars are not orbiting our galactic center, but seem to be ejected from the center, slowing down with distance from the center. Can any collision model be valid? Note how the spiral structure appears largely undisturbed. I suspect the spiral was actually formed from a particularly massive mother star ejected from the original explosion in the distant past. Over billions of years, the spiral core ejected newly generated material radially, forming the spiral. Note the luminous region near the core of the spiral. This is new matter forming stars from the core ejections. And note the lower edge of the spiral is distorted by the nearby original massive cores. This supports the limited range of gravitational disturbance predicted in SQK theory. And note the large red halo surrounding the original bare core, similar to the Fermi bubbles, indicating a repeated history of ejections. SQK is a radically new approach. However, decades of current thinking are leading to dead ends. What if First Law is really violated under special conditions. LaViolette's Pioneer Effect prediction should compel any serious scientist to pay attention. What if First Law of Thermodynamics is really violated under special conditions as predicted by SQK? LaViolette's Pioneer Effect prediction (photon-blue shifting) in 1985 should compel any serious scientist to pay attention. In 2003, he predicted that time dilation would be shown invalid in an extensive quasar survey. Done this spring. However, most are vested in current models. I am not. And I see on another thread you also reject relativity and BBT. Pretty much in science denial? There are many others here that closely follow your prescription for finding the 'truth'. They advocate for neutron repulsion, AWT, plasma cosmology, anti-gravity matter etc. They all ignore mainstream astronomical conclusions. They apply a (very) little logic. And not so amazingly, they all claim that observations are supporting THEIR theory. They can't all be right. So how to sort them out? You want to throw out all "mainstream astronomical conclusions" and replace them with what? Scores of poorly thought out, demonstrably wrong qualitative cosmological "notions". This is not my theory. I was a skeptic for more than a year. However, "mainstream" is caught in the current. Einstein said "Imagination is more important than intelligence." We need more imagination applied to these observations. I find too many vested minds in denial. You have not examined this theory in detail. Find one fault, and reject the entire idea. Isn't that how to calm the mind? My background in control systems theory allowed me some insight, perhaps, into SQK where others might not. Still, it was not easy to overcome preconceptions. I think the theory holds promise, but I am in no position to defend it. Clearly, current theories are not working. Here is an example of an earlier stage in the same process, with a massive galactic core with continuous steady outburst for perhaps millions of years. Unlike most, and our own galaxy which have longer quiescent periods, this core has been in continuous outburst for many millions of years. Explain how this extremely luminous object could be powered by accretion?? The galaxy is in the process of destruction, with the core laid bare. Stars have moved radially outward, and will eventually form the basis for satellite galaxies, which will grow from within themselves. Eventually, this giant core would form the nucleus of a forming galactic cluster, like many examples we observe where highest mass density in the cluster has been shown to located near the centers. Unlike out own galaxy, this core has been in continuous outburst for many millions of years. Here is evidence that active galactic cores can shut off in only thousands of years, rather than millions. And LaViolette maintains that they can turn on quickly too. Our galactic core star could surprise us with a cosmic ray volley at any time. The Hopi indians legends reference a blue star visible during the daytime. And now our own galactic core does not spin. It is not fed by accretion. And yet it ejects Fermi bubbles. Surprised? Somehow, mainstream became convinced of fantastic big bang ideas were reality a few years ago. Has science lost credibilty? Or has the mainstream been influenced by DoD counter-intelligence, aimed at keeping classified physics classified? I have to wonder. Just suspend judgement, and test the observations against this cosmological model of matter and energy generation from galactic cores. Notice in the photo the emergence of a small bright spiral located closer to the bare core just to the lower right of the bare core. This is in the early stages of formation through core ejection of newly nucleated matter. It is very bright, and likely located somewhat in the foreground. On the left of the frame we can notice a number of satellite dwarf galaxies which may eventually form spirals themselves. Hence, we see the early emergence of a galaxy cluster forming through matter nucleation and ejection. If I wanted to divert science from a physics associated with core nucleation and ejection, I would inject the opposite argument: Invisible black holes swallowing everything! And the universe expanding due to unseen forces! What a fairy tale!